“ The Scriptures teach us that Sri Guru is non-different from Krishna. Krishna in the form of Guru blesses the fortunate devotees." 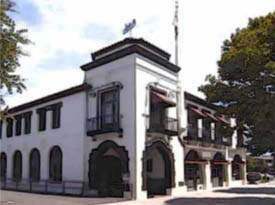 On the anniversary of the day he received Sannyasa from his beloved Srila Guru Maharaj, Srila Bhakti Sundar Govinda Dev-Goswami Maharaj surprised and delighted the devotees by leaving his Soquel quarters near twilight and traveling to the Veteran's Hall in downtown Santa Cruz. Nitya Hari Prabhu, Mathuranath Prabhu, and many other devotees had arranged for a grand festival of kirtan, Hari-katha and prasadam followed by Harinam sankirttan and a benefit musical performance to raise funds for the annual Prasadam distribution that takes place at the holy feet of Sri Giri-Govardhan near our Govardhan ashram and temple of Sri Giriraj in India. Nearly 100 devotees and guests greeted His Divine Grace with loving obeisances and showers of fragrant rose petals. Srila Gurudev spoke about some of his divine memories with Srila Guru Maharaj. What felt remarkable was that His Divine Grace spoke to the crowd of many young people in a most casual and affectionate manner, as if speaking to an intimate circle of devotees. Smiling, he recalled how his Guru Maharaj had chosen him as his personal assistant and had forcefully taken him into service life. He said that by the grace of Srila Guru Maharaj he understands Krishna, and that if we can also follow the advice of Mahaprabhu by being humble, tolerant, and offering honor to others, then we also will get that understanding by the divine blessing of Srila Guru Maharaj. The audience listened attentively, soberly, as His Divine Grace emphasized the importance of sadhu-sanga, high association, for our spiritual life. He reminded us that good association will give us so much benefit, but poor association will give us the opposite effect. Srila Govinda Maharaj said that his Guru Maharaj would be very happy to see this program and all the sincere guests. He also told us that he is very pleased by the enthusiasm of the younger devotees who have made these arrangements. He gave a personal note of appreciation to Nitya Hari Prabhu and bestowed the blessings of his Guru Maharaj on everyone. Srila Gurudev mentioned that his Guru Maharaj is giving him strength and without this strength he would be unable to distribute this mercy. By continuously giving praise to Srila Guru Maharaj, he reminded us how his generous distribution of Mahaprabhu's audarya-lila has blessed the entire universe with its gentle grace. After speaking, His Grace pleased the entire crowd by singing the Jaya Radha Madhava prayers with a strong voice and deep emotion. After some time Srila Gurudev had a senior devotee take over the kirttan, gave his beautiful smile and affectionate blessings, and rose to take leave. Many devotees and guests followed Srila Gurudev out and once again offered handfuls of rose petals. On this holy occasion of His Divine Grace Srila Bhakti Raksak Sridhar Dev-Goswami Maharaj's Appearance Festival, Srila Govinda Maharaj showed extraordinary strength and dedication by speaking in the morning and traveling to San Jose to speak at the evening program too. His Divine Grace offered flowers to His beloved Guru Maharaj. He mentioned that from his first day at Sri Chaitanya Saraswat Math he very fortunately received the affection of Srila Guru Maharaj and became engaged in his personal service. His Divine Grace explained again and again the glories of Srila Guru Maharaj in many different ways. He told us that Srila Swami Maharaj was very high and that all over the world people could see by his accomplishments how extraordinary he was. He took the instruction of Srila Saraswati Thakur very seriously and opened temples all over the world. Srila Govinda Maharaj noted that even such a high devotee as Srila Swami Maharaj was, he referred to Srila Guru Maharaj as his siksa-guru. “How then can we understand the greatness, the potency of Srila Guru Maharaj,” Srila Gurudev said. Then he added, “The concept of siksa-guru is very, very deep,” and he would need to discuss that topic another time. Srila Govinda Maharaj explained how it was Srila Guru Maharaj's humble nature to stay always in the background. He did not want to take on a prominent role or have many disciples. But his Gurudev, Srila Saraswati Thakur could see his shining qualities and one day asked this crown-jewel of Paramahamsas, Srila Sridhar Maharaj, to sing Sri Rupa Manjari. In this way the mystic transmission of spiritual authority and power in the line of Srila Rupa Goswami was given over to Srila Guru Maharaj. On this powerful note, Srila Govinda Maharaj ended his talk by singing in a deep and moving manner the same devotional song — Sri Rupa Manjari Pada. Following this sweet kirttan, His Divine Grace retired to his room to rest and Sripad Bhakti Sudhir Goswami Maharaj and Sripad Bhakti Pavan Janardan Maharaj continued the program by speaking powerfully and affectionately about the immeasurable mercy of Srila Guru Maharaj, the Emperor of all Sannyasis and the Sun of Divine Devotion. They then delivered praise to his dearmost Divine Servitor, Srila Bhakti Sundar Govinda Dev-Goswami Maharaj, whose moon-like mercy continues to bring the light of Srila Guru Maharaj into this dark world. In his prayers to Srila Bhaktivinoda Thakur, Srila Guru Maharaj himself has said that the sincere devotees are like stars that are helped by the moon. The pure Vaisnavas help the stars to radiate light. By reflecting the divine light of the spiritual predecessors they are also able to illuminate others. Hare Krishna. Praying for their grace, I offer my obeisance to His Divine Grace Srila Govinda Maharaj and to the sincere Vaisnavas who are shining with all good qualities.